I know the biggest challenge building the class 26 will be the bogie sideframes. I have wondered about buying something in but in the end stuck to my guns and will have a go at making them myself in plasticard. The first job is to work out what the hell is going on down there. I'll be honest and admit I haven't really paid much attention to these parts - I've seen them of course but don't really know what most of the bits actually do. To this end my plan is to copy the 4mm Class 33 I have noting the changes from the photos of 26's on the workbench and modifying the plans accordingly. To start, some 1mm thick plasticard has been marked up with the basic shape. At this point the curved bits are squared up as I want to keep things as simple as possible. Note how I've marked the waste in each as from experience it's easy to get confused and hack off the wrong bit. Next, some of the corners are curved, probably not enough for the purist but then they probably model by whining on forums rather than chopping up plastic so they can shut up. The sideframes are edged with strips of very thin plastic cut by myself as I didn't have any suitable microstrip and couldn't be bothered to go and get some. In the photo I still have to trim the bottom bits back but you get the idea. Axle boxes are made by punching holes with a leather punch. This gives circles of the right size (the tool allows you to select different sizes) which just have to be trimmed to fit the slot and glued in place with liquid glue. So far so good. Now I need some springs. The Formula 1 season has finally started and the TV has adverts appearing on the commercial channels for a brand new partwork. 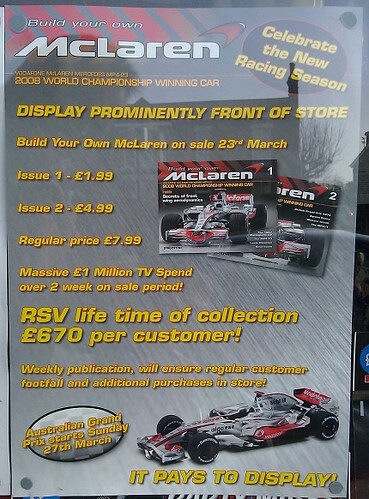 You too can build a 2008 racing car. Woo Hoo ! Regular readers will know I have mixed feelings about partworks. The total cost is high and sometimes the parts are, quite frankly, rubbish. On the other hand, my Dad is building the Bismarck and this is really impressive. When looking at the cost, you have to bear in mind how long it takes to write the instructions. They have to be aimed at idiots as do the kit parts - leading to heavy R&D bills. The overall price though is the thing that amuses me. We all get the calculator out when we see the adverts but my local Post Office has saved me the bother. Somehow I don't think, despite what it says at the top of the page, that this is a poster for the window. Instead it's a sales tool to persuade the retailer to stock the partwork. Just in case you are interested, here's the website. It was a long while ago I built my Garratt but I don't recall any particular problems with clearance. The main thing I did was to rivet the parts together which reduces the sideways slop considerably. The first corner took forever but with practice the last one was done in about 20 minutes ! The other trick, is where the valve gear links to the cross-head, you can't (or I couldn't anyway) use a rivet. A brass pin has to be soldered in. Place a bit of tin foil from the kitchen between the crosshead and connecting link and push the pin through. 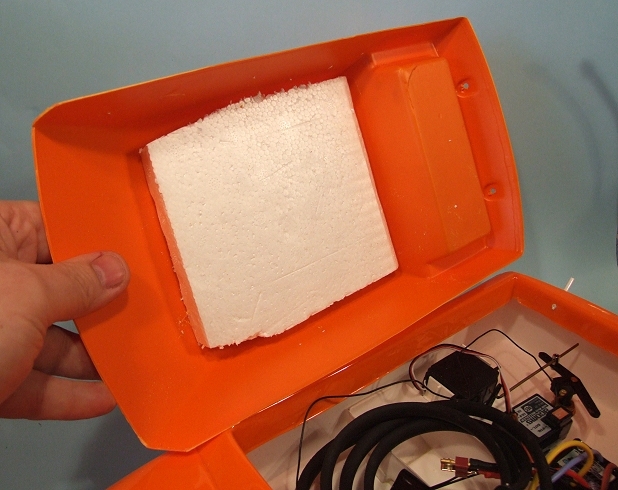 This should allow you to solder without the solder gumming everything up solid. It works most of the time for me but do practise using some scrap metal first. 4 months isn't bad for building a locomotive I suppose - although it's less impressive when you don't have a proper job and ought to be able to find a lot more time in the day for this sort of thing. Still, the locomotive is finished now. The yellow paint job has been calmed significantly with a wash of Precision "Underframe dirt" followed by some misting of rust, earth and dirt from the airbrush. While it might have started as a rather shocking hue, the effect of the weathering is to calm it down and the results, I think, are fantastic. 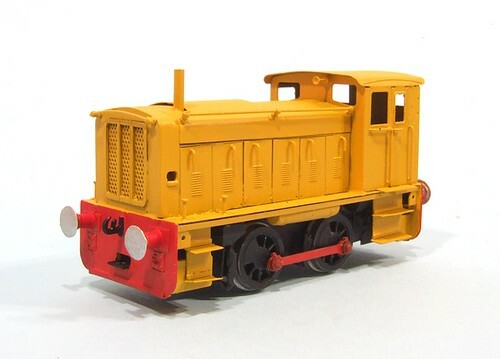 I'd never have thought of painting the model yellow, my preference tends toward black for this sort of model loco, but the customer wanted 1970's and by then yellow was a real possibility. I'm so glad we went for it. Another nice touch is the driver hanging out of the window. Again, not my idea but it works a treat. In truth, he's probably a bit too far our but we can get away with it. So, a result. 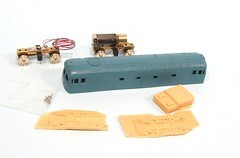 A nice HO scale etched brass kit. Easy enough to built in diesel-electric form and a very satisfying result. I'm sure this show has changed. Last year it was called the Large Scale Model Rail Show and now it's the Midlands Garden Rail Show with the subtitle "Large Scale Model Rail Show" - a bit like my book is "Seeds of Change" with the more entertaining but less chick-lit subtitle "The DirtBoffins Revenge". Like the book, I suspect this is to reposition the event in response to the larger, but one day, 16mm Scale AGM held in a few weeks time. It's also a lot more Google-friendly for people who build their train sets outdoors. This isn't the only change. First, the ticket price has dropped from £8.50 to £6. I'd noted in previous years that this had seemed high for the event in the hall and so the new price is a very welcome thing. If I normally qualified for a concession I'm not so sure I'd have been pleased - there were no concessions this year. Judging by the age profile of the visitors I suspect this made the overall income about the same as before. Anyway, once you'd paid to get in things improved further. Gone were the shell-scheme trade stands. 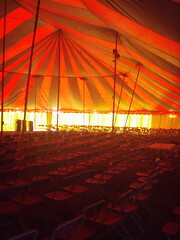 Instead the venue was open-plan like any other event, and bigger. I haven't counted but there were definitely more traders in place. 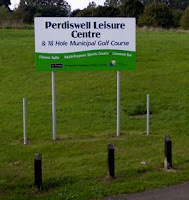 I spotted several new boys who tempted money from my wallet including several book stalls and one new kit manufacturer. If you wanted a shopping experience, this was an awful lot better than previous shows. Layout wise, well Newchapel Junction wasn't in the same spot as always but it was still there. I still like the model but every year ? Other than that I liked Barton Ings Pipe and Tile Works in Gn15. Very nice scenery although a little lacking in operation interest. I'd love to built it though ! So, in summary - this is a hugely improved show and I'm looking forward to next year. What is it like inside the barrier ? 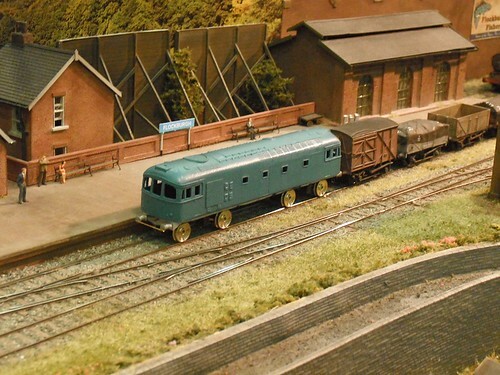 Having returned to modelling after a 40 year break and joining the LWMRS I wanted to experience being behind a layout during a show. Phil & Brian Parker were good enough to invite me to the Worcester Model Railway Exhibition in March, and to help operate their Flockburgh layout in 3mm. I won’t describe the layout as you can view it on Phil’s website, but suffice to say I found the whole experience very therapeutic. Apart from a minor hiccup of a point needing re-soldering the layout operated like a dream, and whilst the operational possibilities seem at first glance to be limited they are surprisingly satisfying. I intend to build my own exhibition layout in due course and whilst I have some firm ideas on gauge, location and era, it is the practical matters that I need to explore and take advice on. Will the layout fit in my car, does it need too ? How is it to be erected and dismantled ? How will the lighting rig work ?, an issue, in my limited observation over the last twelve months, far too many otherwise brilliant layouts fail to address. How high does the layout need to be to give visitors the best possible view, and how high, and of what quality does the back scene need to be ? Another area that many layouts seem to take scant regard of. I could only attend on the Sunday of this two day show so missed the setting up, but when I arrived at the venue some 30 minutes before opening Phil & Brian had already set the layout up for running and cleaned the track. I was pleasantly surprised how quickly I grasped the control system and fiddle yard set up, and most importantly where to get the teas! Back on the layout I was concerned that visitors would ask me too many questions that I would fail to answer, but as 90% were about the Spratt & Winkle magnetic uncouplers, I soon learned the explanation, and directed them off to Wizard models to learn more. Dismantling and leaving the show was ‘interesting’, as some quite large layouts leave quickly with what seemed like military precision, whilst others, I observed, as we were leaving some 25 minutes after closing and operating right up to the final minute, were only just starting to pack away. This first experience has certainly wetted my appetite further to build my own exhibition layout, and given me a number of ideas to incorporate, and likewise I’ve had a few ideas that I’ve now decided to reconsider or abandon all together!! My thanks to Brian & Phil, for an excellent day out. 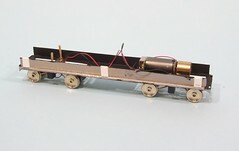 Most of the model railway rolling stock I build is, as far as the colours go, dull. 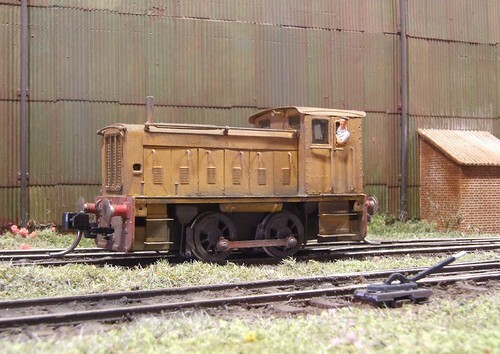 Not the 165DS shunter though. The specification calls for something 1970's and that was the era when industrial concerns decided that it would be a good idea for large lumps of machinery moving around to stop being camouflaged and instead get some of that hi-vis paint that we see so much of today. It seems that the bosses had become bored of people being sliced in half on the tracks. This, and the improvements in paint technology, meant locos started to appear in wasp stripes, yellow and black checkers or just plain yellow. Moving parts such as connecting rods were picked out in something other than dirt in an effort to keep distracted shunters hands out of their way. All this explains why this particular shunting locomotive has been sprayed with RailMatch 210 - Warning Yellow. And very bright it is too. To relieve the livery, red bufferbeams add some welcome variety. 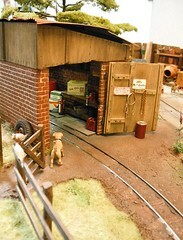 It's not based on a particular prototype but then there weren't any real standards with local sheds doing their own thing. If I was really keen I'd do some wasp stripes but I'm not and I don't think the results would be that good anyway so I've decided the in-house painters want an easy life too. What I do realise is that it's looking more than a bit Big-big train. Good job the next task is to weather the model into proper industrial muck colour. Time for some "proper" modelling. 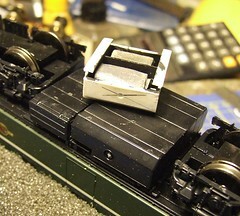 Under the 3mm scale Class 26, I need some underframe details. To this end, lots of photographs have been wrenched from teh Interweb and plans photocopied. I studied them really hard and then came up with a better idea. In a pile of modelling stuff is a Heljan Class 33 that I've borrowed. Turning it upside down in the Peco loco servicing cradle give me a good view of all those funny shaped bits under a diesel. In thoery, it was just a case of measuring each item, dividing the lenth by 4 and multiplying it by 3. Well sort of. The main fuel tank took me two goes but now the result looks pretty good. Of course, the Class 33 and 26 differ slightly, especially since I want an early 26. That's what the pictures, a bit of imagination and a realisation that in 3mm scale, no one can see all the detail, give me. 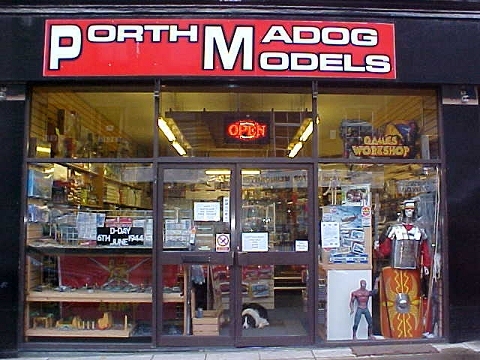 PorthMadog Models have moved. Some time ago actually. 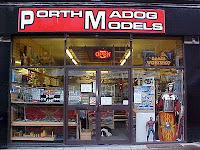 Thanks for mentioning our model shop, PORTHMADOG MODELS on your site and placing a picture too. BUT.... we have moved opposite across the road to Number 6, Bank Place to a shop two and half times bigger.That was in 18th October 2009, never looked back and we are still. Now the largest (so I'm told) model shop of its kind in North. Much more stock, room to move, place to sit down. Hooray ! 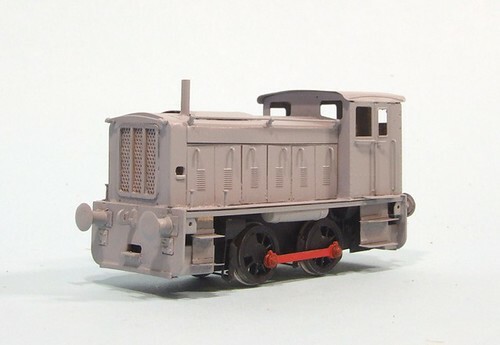 The Ruston 165DS is now in primer ! A nice coat of etching primer has persuaded me that everything is looking OK. The can is getting empty so it will off to Frosts to get another I think. To make sure I got a decent result, the can was warmed in the sun and then heated a little more with a hairdryer (careful with this) as the garage it lives in is a bit cold at the moment. For a change it got a decent shake too. Even then the first squirt was at newspaper and not the model. Keith asked: Can you help me, I am trying to track down the inventor/maker of B&B Couplings. I did a bit of digging and came up with: Sorry - I can't help with this. I thought ti might be Wizard Models (http://www.wizardmodels.co.uk/FrameSetShop.php?DM=wizabout) but they are DG & Spratt & Winkle only. I post this in the hope it helps someone. 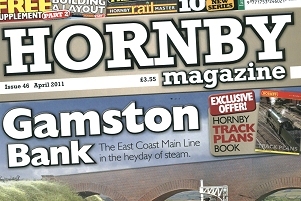 A frequent lament of model railway society magazine editors is, "Why is no one writing articles for the mag ?" Now an obvious answer is that it's because they don't pay for them. Submitting articles is part of being a member of the society which is all about sharing information and if they started paying members to do stuff, where would it end ? The thing is that it's never been easier to produce a piece for one of these publications. We all have wordy processors to save us from the "joys" of producing out text in longhand. This can be e-mailed to the long suffering editor to save him or her the chore of typing it all in again. Digital cameras, even cheap ones, can give more than adequate results - no more collecting a packet of snaps from the camera shop and hoping they have come out OK.
And yet while it is easier, less and less people are getting into print. When I say print, I mean something that involves ink on paper. Spewing forth your opinions on an Interweb forum does not count. 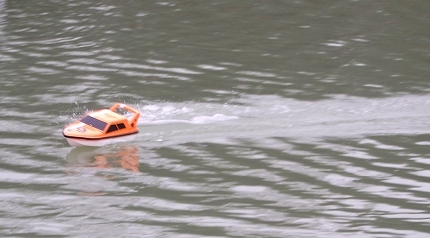 The better weather recently has seen me back out on the water with the Club 500 model racing boat. It's a bit faster than the Slingshot I'm used to so a few practise laps are in order before the start of the season if I hope to do anything on the leader board. Batting the boat around a couple of weeks ago I hit a buoy. The top flipped off and only the receiver wire being taped to it allowed retrieval. The collision had caused the motor to jump backward and away from the propshaft. The model was dragged back to the bank, repaired and headed back out again. A few minutes later, I was hit by another practising 500. This time the top flipped off, tantalisingly floated for long enough to get the long reach pole to the water, and then sank before we managed to get a hold of it. It seems that Club 500 tops don't float, despite being made of plastic. Despondent, I returned home. Eventually I gave Model Slipway a ring. The very helpful lady on the other end of the 'phone was great - she checked her stock and since they had some slight seconds of the orange tops available, offered to send me one for the cost of postage. Result ! The new top has been fitted and now has a slab of polystyrene fitted in the top. A quick test in the sink shows this will be sufficient to keep it on top of the water in future. As an added insurance, a bit of wire has been tied to the top and attached firmly in the boat. Next time, the top will float and be easy to tow back to the bank ! With the model on the bench I got on with decorating the hull so it stands out in a pack of racing models. I had considered some fancy paint job but in the end decided I couldn't be bothered. 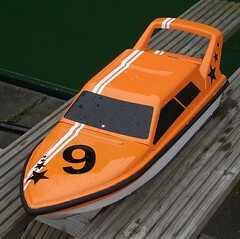 These boats aren't about looks, although I think they look smashing, they are about racing. Some white vinyl stripes, numbers and stars will do for me. The result looks striking - probably better than the painted version would have. While I'm doing this HO scale thang, I couldn't resist posting pictures of the UK Ruston 165DS locomotive coupled to a US bogie reefer. The contrast in size between the two items of rolling stock is very interesting. While I'm not an expert, I think this is a pretty standard wagon on American railways. It towers over the locomotive though. 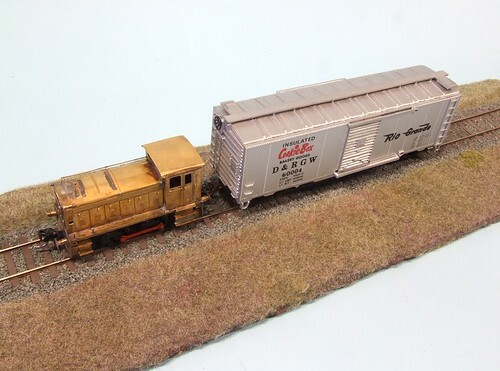 The difference in volume, allowed by thier more generous loading gauge, shows why in the old days you could fit a motor into a 3.5mm scale American loco wheras to do the same with a UK one, we had to blow the scale up to 4mm to the foot whilst retaining the same gauge. Of course, nowadays we have nice little motors and sophisticated gearboxes which will fit. But it's too late to alter the most popular scale. Anyway, if you've ever built a locomotive with waggly bits on the otside, you'll have appreciated the extra space 'twixt wheels and footplate edge. If God had meant us to fit Kadee couplings to UK stock, he wouldn't have given us 3-links. Hover the customer request Kadee's so that's what I had to fit. Now I'm not completely new to these couplings - all my On30 stock has them fitted 'cos that's what they do on the other side of the pond. I even knew there were several variants. I'd only used No.5 though, mainly because it is sold as " 'ole reliable" which seems good to me. 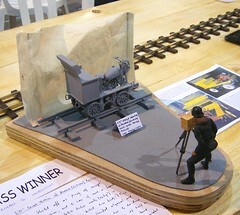 I mean, who would buy a model railway coupling called " o'le pain in the arse" ? Apart from P4 modellers anyway. I pondered fitting one of these to the 165DS but to get the knuckle bit far enough out (the back of the knuckle level with the buffer face) , the draft box would be sticking out of the buffer beam. That would look horrible. Worse, half of the thing would be inside the beam and therefore in the way of the body fixing screw. As I say, UK kits aren't designed for this sort of coupling. Spending time on teh interweb, the solution appeared to be to use a different member of the Kadee family tree, specifically the No.20, which I thought could be pinned to the face of the bufferbeam and handled the wobbling functions at the knuckle end. I found a site and placed an order for these and a few other bits. A couple of days later I received an e-mail. The whole order was on back order. I rang them up and was told they were putting an order in to the States and I would get my parts in 3 or 4 weeks. Now, this is web. If I want bits from America, there is no reason for me not to order them straight from there. Apart from some US retailers refusing to supply outside their borders in case we use them for terrorism or communism or something. I order from the Uk because I don't want the wait. I cancelled the order. Next I ordered from another retailer who's site indicated the parts were in stock. That was 3 weeks ago and I'm still waiting. Luckily, at the weekend, no less than 3 stands had a selection of Kadee's for sale. DC Kits got my money and I left with a packet of No.20's. To fit them I spent some time measuring and then cut a rectangular hole in the bufferbeam. The tail of the coupling was shortened and poked through this and it looks OK. The loco couples to a wagon and uncouples on the ramp. Permanent fixing will involved popping a pin through the tail and to this end I soldered a small shelf which I will drill a hole in, below the hole. But I'll paint it before fixing 'cos I don't think a coat of primer and enamel will do anything for the mechanics. On the bench is a modern fishing boat which needs some details. 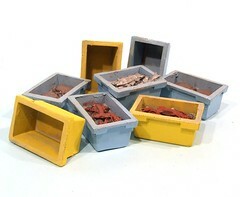 Boxes of fish would seem an obvious addition but painting these resin castings has forced me to think - never a good thing. Most of my modelling projects are based in the 1950/1960 period. As far as paint goes then as long as you have plenty of dark brown, beige and grey, you are sorted. Even if we didn't see the period through black and white film, there wasn't a whole lot of colour around in real life. This is confusing for younger modellers who have always lived in technicolour. Some I understand were even born during the 1980's when florescent colours were everywhere, although they will probably be in bed by now as it's school tomorrow. Anyway, plastic fish boxes for a modern era need colour. Not being a regular on the oceans I've made an educated guess and gone for yellow and pale blue. Both gloss colours as these models are 1:24th scale and so big enough to show a sheen. A wash of pale grey provides the slight effect of wear - plastic boxes don't really weather properly. These are quite pretty really. I could get into this modern modelling, but then I'd need to buy even more paint and Mr Humbrol has done well enough from me over the years. During the weekend, when there was a suitable 3mm fan occupying the barrier, I gave the Class 26 a run to see if it would do what I required of it. The good news is, it does. In fact it does very well. The BullAnt bogies work smoothly and quietly. Far quieter than the Class 22 - it's like Brian Sewell compared to Brian Blessed. The regauged axles trundled through the pointwork apart from the unpowered one which lumps slightly on one point. They stay on the track though. Haulage capacity is around 6 vans through a couple of reverse curves. With a bit more weight, it's just got a lump of leftover chassis casting in at present, this should go up to beyond the capacity of the layout. The unfinished model attracted a lot of interest, in fact that's why it did so many trips around the model. People seem to be interested in seeing, rather than being told, how models are made. Not too many though, we don't want shows full of half-built models thank you. Please finished most of them thank you. In fact I was well pleased, right up to the end of Sunday when a wheel fell off. Looks like I need to glue it before putting it back on. No, not a best layout competition. There wasn't one, and little layouts don't win those anyway. No, our team won the Saturday night quiz at the exhibition. The one for exhibitors, club members and traders. The top team, heroically named the "Flockburgh Wizards", made up of myself, my Dad (The Flockburgh bit) and Andy from Wizard Models, correctly recognised all the obtuse photos taken of layouts and trade stands at the show. This was despite none of us having had a chance to take a proper look around the hall at that point. 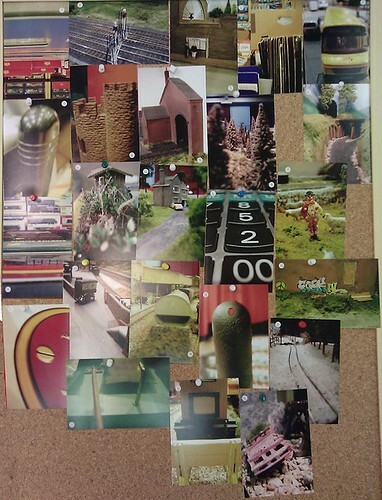 As you can see from the attached picture, the shots were challenging to identify, but by deductive reasoning, observation and mostly sheer luck, we identified every single one correctly. If you want to nick the idea for your own quiz, then do - it's great fun ! Anyway, what about the show ? Excellent. The trade was good, the layouts were good. For your fiver entry fee you found a sports hall full of stands that would occupy any modeller for many hours and should have emptied thier wallets too. The move from the centre of Kiddermister didn't seem to have hit the numbers attending. The location was easy to find although it lacked the closeness to a preserved railway or a town centre. Flockburgh ran pretty well. I had to resolder a couple of blades to tie-bars. The Jinty was particually smooth running for a change. The biggest problem was the recently repaired Gaugemaster controller, which lasted 5 minutes so it will be going back to them for another go. Good job the old one held up ! On Sunday, Mike Harper joined us to get his first taste of life inside the barriers. Because of his enthusiasm we generously let him do most of the operating leaving us to lounge around and look at the show. Except when he was dispatched to collect the teas. There was a (very nice) lunch included though.Hope you had a good time Mike. Last Monday, the weather was fine so we set off for a trip to Swinderby Antique Fair. Just to look around you understand, not to spend any money. It's just that these mega-fairs appear on TV antique shows and we wondered what they were really like. The answer is huge. Apparently there are 800+ stalls on an airfield and I can well believe it. 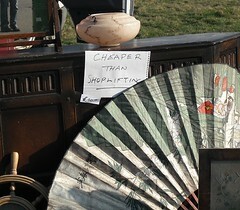 Entrance before 10am is a sizeable tenner - the early part of any antique fair involves traders selling stuff to each other. The public can come in but are discouraged by doubling the charge. That way the trade get all the best bargains. With my modelling head on, I spotted a lot of tatty yachts. Nearly all of them the horrible, cheap, Chinese display models with their masts broken off. None would be any use for sailing and to be honest, probably aren't worth repairing. I did find a couple of proper pond yachts but again these were out of my price range and quite frankly, they take up a lot of space and I can't be bothered with wind powered sailing. Two goodies were found, a 36 inch Aerokits Sea Commander for 50 quid. Partly built, painted with Dulux and with all it's fittings, this is a boat we've considered adding to the Parker fleet for a while and this is a reasonably good 'un. Sticking it on eBay would probably double the money thanks to the affection out there for Aerokits. The one that got away was a fibreglass hull grey boat (a tender I think) which was reasonably built but not finished. All the bits were apparently in the hull and the radio gear, speed control, motor etc were fitted. £40 and we left it thinking we'd look again at it. Half an hour later it was gone. The moral is, buy it when you see it ! The other think I noticed a lot of were plastic kit aircraft. Made up ones that had then been broken. At least three stalls had a selection for sale and I don't understand why. I meant if they had been nicely made then you might might want to buy one but who wants something with bits missing ? You'd need to buy another kit to replace the missing parts, in which case why not just build a new one ? It is sad to see models that someone has spent hours constructing heading for the tip but sometimes this is the only option. What makes dealers give up valuable table space for unsalable objects, that they obviously transport between events jumbled up in a box, beats me. Would you buy one ? By the time you read this, hopefully we are standing behind Flockbrugh at the Wyre Forrest Model Railway Exhibition. This used to be Kidderminster Show but thanks to the leisure centre they had previously operated from messing them around, it's moved. Looks like a good show, why not visit the website and then come and see us ! Something a bit different from me in this month's Hornby Mag - For Bolsover (the latest layout built by the magazine), I was asked to knock up some signals using Ratio Kits. These turned out to be pretty fiddly, but the results are very nice. Two homes, two brackets and a super tall signal were required and that's what I produced. These aren't traditional kits, you can assemble the parts in lots of different ways to make the signla you need for a particular location. The tall one has two posts stuck together for example, but looks very convincing - at least to my untutored eye. In deference to the target audience, and because the parts are plastic and not that robust, the finished models are non-working. If you want the arms to move you need (IMHO) to do more than just stick the bits together. 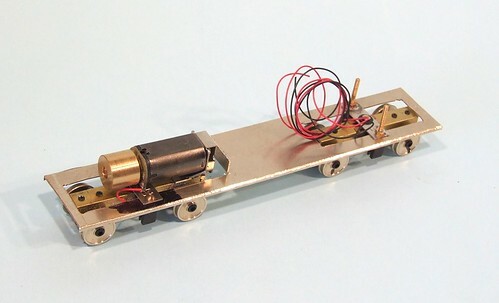 Plastic cranks don't seem like a recipe for reliability to me, especially on a layout which will the lumped around the country like this one will be. Mind you, I think it's not out of the question to do this, but then I'd replace the arms with MSE items too. Elsewhere there is a real fun project - repainting 3 VW Type 2 vans into BR colour. It's not a difficult job, just strip the paint off the die-cast models and spray them with the new colours. For such little effort, the results look fantastic. I'm not sure where they will end up on the layout, but they will be there somewhere I think ! The basic chassis I described on Tuesday has now been beefed up and turned into something suitable for use on the layout. First, I've added some much deeper rails along the sides. 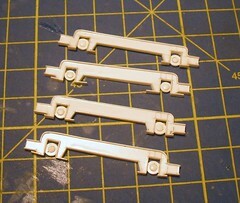 These are leftover from etched kits. They don't need to be anything like as deep but it didn't seem to be worth cutting them down. At least they will stop the chassis from bowing ! The BullAnt chassis work well, although in my stupidity I had to dismantle the non-powered one to get the insulated wheels on the same side all the way along the loco. And then reverse the pickups too. 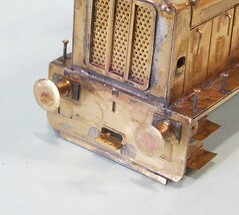 The biggest issue is the very thin wires and lack of access on the powered bogie to solder these in. The attachment point is hidden behind the flywheel requiring some delicate poking of the iron to do the job. Finally, the body has to be attached. The plasticard pads on the side just slide into the shell and friction seems to be enough to hold it in place. For the moment anyway. 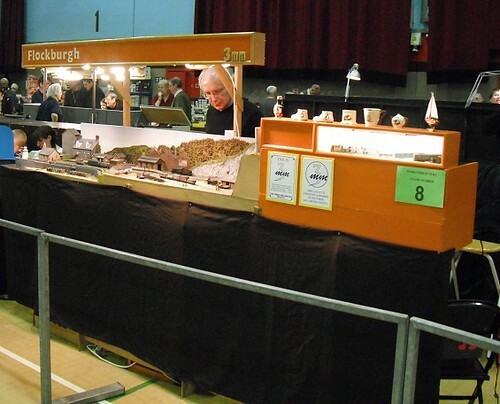 Over the last few years, more and more model railway exhibitions have required those displaying layouts to complete a health and safety evaluation as part of the paperwork we all have to fill in before attending a show. This is particularly exciting when you are confirming three shows at the same time and have to complete the form for each one. If I mentioned this on certain e-forums it would start a rant by some members on the whole 'elf and safety culture. This always quickly spirals away until we have long left the realm of toy trains and instead are demanding a return to the days of children fixing looms in factories while the machine is running. I have little sympathy for this point of view - anyone who has seen daytime television on the commercial channels will know that every single advertising break includes at least one ad for personal injury lawyers. The gist is "Has something bad happened to you ? Yes ? Well then sue someone. Anyone. You are entitled to compensation. And there will be loads of it.". I've even been rung up by these companies trying to persuade me to sue for fictitious accidents. In fact I feel sorry for the HSE. They spend thier lives working out how to stop, often stupid, people getting hurt. Then people who know nothing or the real rules and regs invent reasons for things not to happen and claim it's down to 'elf and safety. There is even a series on the HSE website dispelling some of these myths. 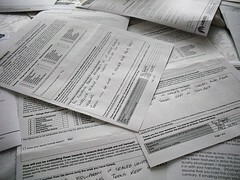 Anyway, these forms are appearing at many serious exhibition venues. I've had to complete them in the past when taking stands at other events so it's hardly surprising that we get to see them when taking a train set. After all, it's the same as any other stand you see. The correct way to fill out an assessment is to take it seriously. Our hobby may have the image of being carried out by dull, grey men who wouldn't know excitement if it approached them in the street painted pink and with a neon sign saying "Look, excitement" on it's head, but there are hazards. For example, cable reels. If you use them wound in, they can heat up and (possibly) catch fire. Unwind them, as site electricians are wont to do, and you've many metres of cable lying around to trip the unwary up. On the form you note this and say that you'll tuck it away or tape it down. Then there are sharp objects. I can't be the only one to have cut a finger by plunging my hand into a toolbox and finding something sharp. That's my own stupid fault, but if you insist on leaving the toolbox on the table, as many demonstrators do, then what's to stop the public doing the same ? And then hollering for an ambulance chasing lawyer ? Worse, there are people who do stupid things. Leave exposed pointy screws sticking out, think that mains electricity can be handled by those who struggle with point motor wiring and think safety comes as a roll of insulating tape or hang switched on soldering irons where anyone can touch them. I have no desire to be injured by those idiots. The result won't be a court case though, unless I end up in the dock for bludgeoning them with a bit of their own train set ! Hold on, no I didn't. I'm not spending that sort of money - I could buy the real thing for leass ! 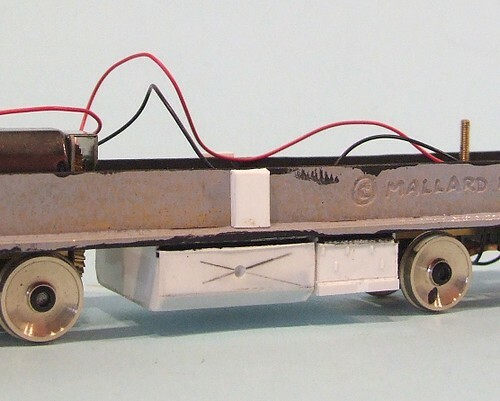 The basic idea of a RTR chassis is sound though - you have a separate tray holding the motor and unpowered bogie in place, on to which the body is clipped. 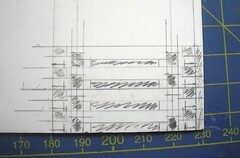 To replicate this all I do is cut out a rectangle of nickel silver and bend down the edge 1.5mm to reduce flexing. Out of this are cut two rectangles in which the bogies swing. I won't bore you with all the measurements take but the most important is working out the bogie centres. Everything else for the whole is relative to this. The bend up flap near the flywheel is what happens when you get the dimensions a bit wrong and need more hole. Of course if you ask, I'll swear it's a safety feature in case the flywheel explodes under high revs ! Time for a new project, and one for me this time ! We need more locos for Flockburgh and as it happens, I have a few kits stashed away. 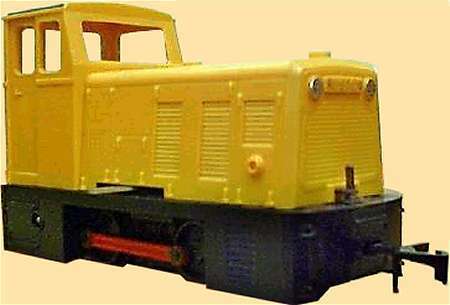 First out of the box is this, a Bruce Smetham Class 33 Diesel body. It's cast in resin and as well as the body, there are some pretty horrible lumps for the bogie sides and tanks. My experience of Bruce's kits is that the under footplate bits were done on a bad day and escaped as seconds. Certainly I wouldn't expect him to put out anything that's more air bubble than resin ! Now, I don't need a Class 33 for a layout set in Scotland. My plan is to turn it into a Class 26. 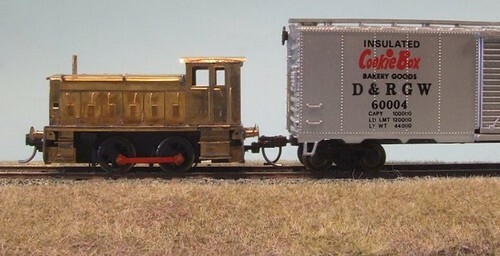 This is a conversion we used to do (well, other people, not me) in the old days in 4mm scale. Once upon a time you couldn't just buy everything off the shelf you know ! To make the model work, I've bought a set of BullAnt bogies which have the right wheel diameter and a wheelbase only 0.5mm too long. Near enough for me, especially if it saves me a construction job. How normal people see railway modellers. A friend helped me out with the press release for our exhibition a couple of months ago - she does PR and re-worked my words into something completely different and a whole lot better. I therefore wasn't too surprised to see she'd dragged her husband along to the show. "So, what did you think of it ?" "Errrmm. Well; it all seemed a bit, intense." 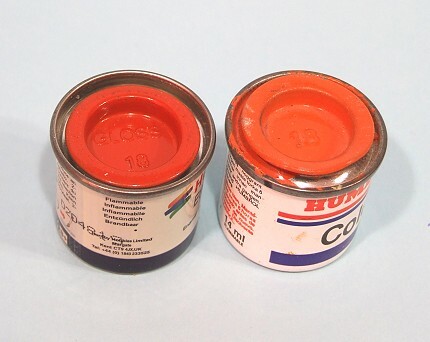 Here are a couple of Humbrol enamel paint tinlets. On the left is Number 18, Gloss orange. On the right is gloss orange, number 18. The left tinlet is several years newer than the other. I plan to spray the paint so while my aged tin will probably work, it's likely to be on the tick side and give the airbrush and its operator, some grief. What surprises me is the difference in the colours of the tops. I know the standard advice is that if you need several tinlets, get them at the same time as different batches can dry with slightly different shades but now looking at the lids I wonder if the entire formulation has been changed ? In my local library, the stock of railway books have been reduced to just under half a shelfs worth. According to friends, a similar thing has happened across the country. Apparently modellers prefer to ask on teh interweb rather than look in proper books full of paper and words. But this is not true everywhere. There is only one current copy of "The Writers and Artists Yearbook" in the West Midlands and it's at Acocks Green Library. That's why I was in there on Tuesday with my co-author researching literary agents for our novel. We started looking for the book in the reference section. It wasn't there, in fact it's kept behind the desk to stop it getting pinched, but what there was were 4 display cases containing Gauge 1 models of rolling stock. This seemed odd as you don't normally get such interesting an high quality display items in a library. Especially one in a scruffy suburb of Birmingham. While looking for the book I then noticed a shelf marked "Books about railways" and then another one. And another. And another. In fact loads of the things. They went along the wall I was looking at and then around the corner and along the next wall too. Loads and loads of the things. Is this where railway books migrate for the winter I wondered ? Airfix GMC Truck a photo by Phil_Parker on Flickr. Job done - The various sub-assemblies of the truck went together nicely and after a quick coat of paint (Humbrol 159, Khaki Drab followed by a waft of Testors Matt varnish) the model is ready for the layout. As mentioned earlier, the canvas parts didn't fit very well but at the back I managed to stick once side of the top to the side of the body, let it dry and then do the same opposite. My concerns about the strength of what I was sticking it to were unfounded. 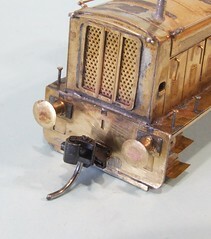 The cab canvas was fitted to the top of the windscreen and then leveled and glued at the back. One impressive part of the kit is the transfers. There are loads of them and they are beautifully printed. If I'd gloss varnished the body, I suspect they would stick invisibly, although they show up more in the photo than real life. I built this model as background scenery for a huge layout. As such it's little more than a stick the bits together job. On the box cover the vehicle is shown in action with loads of cans and wire slung over it. That would make a smashing model, but not for one heading to the beaches, they picked up those "in service" modifications after landing. With a bit of imagination this kit would be the perfect basis for a much more detailed model along those lines, and at the price would provide many pleasant hours of model making. Photo note: This shot was taken using my new HTC Desire mobile phone. After a little tweaking in Picnik, looks pretty good. Not publication quality but not bad for a 'phone. During a trip to Liverpool Maritime Museum on Monday, I spotted this amazing piece of work. The model is under 2 inches long. It is made from scrap bits of wood by a French prisoner of war over 100 years ago. The detail is incredible, especially when you consider the materials and tools available. It's very unlikely the builder would have had access to decent light - construction being carried out when they weren't doing whatever work we required POWs to carry out which I assume means in the evenings by candlelight. 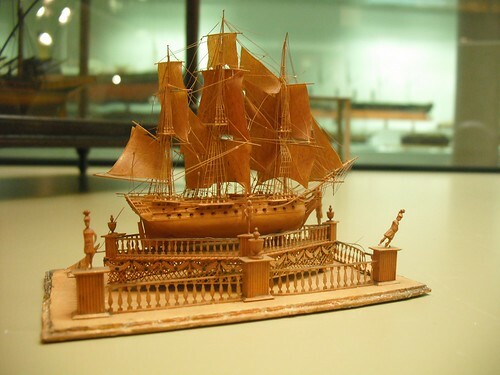 I wouldn't have a hope of creating anything so detailed and delicate even with the facilities available to me nowadays so I can only stand in awe when looking at this little boat. In fact I find it difficult to beleive it exists, other than I've seen it with my own eyes. More photos from Liverpool here. 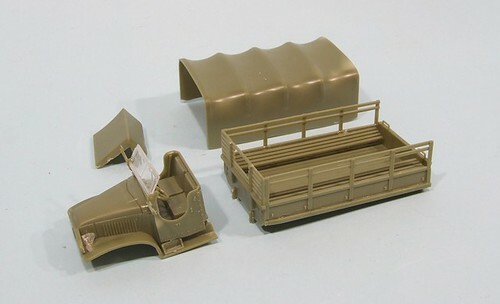 The body of the GMC truck is designed around sub-assemblies muchy like the real thing. 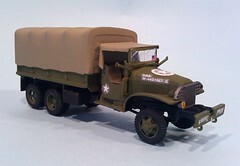 Best of all, Airfix have given the model maker some options so you can build different trucks from the same kit. Some might suggest this is so they sell more kits to people who want to try everything. I like to think it's because they realise our childish minds are pleased to have some bits left over to put in the spares box. I can't be the only one who has Spitfire wheels hanging around from 20 years ago "Just in case they come in handy" can I ? Anyway, the back builds up simply enough although some support under those seats would have been nice. The cab can be made with a canvas top, or metal support for a machine gun, or with canvas sides. The windscreen can be open or closed. What you can't do is leave the back uncovered as no hoops are provided for the canvas. That wouldn't be a problem except that the canvas part is a bloody awful fit. Or at least the one I have is. It's not much too wide but enough to be annoying. I'll have to think about this, maybe I can glue it to one side, let it dry and do the same on the other. But then the sides aren't that strong.